SPACE STATION NATHAN: February has a MEGA PROJECT? Thanks for all the LEGO compliments! Soon I really will be able to write them off as a work expense! I gotta say, though, I'm happy to be back to drawing. I'm no photographer, and those little LEGO tableaus took forever. I'm glad they were such a hit with everyone though, they'll be back. Watch your inbox for your cartoon/avatar pics. I've been sending out the first few, I'll keep them trickling out over the next few days. And, yes, February is going to be a month long MEGA-project thing. What could it possibly be? We miss the LEGO jack already. Thanx they were great!!! There may be ninjas involved. 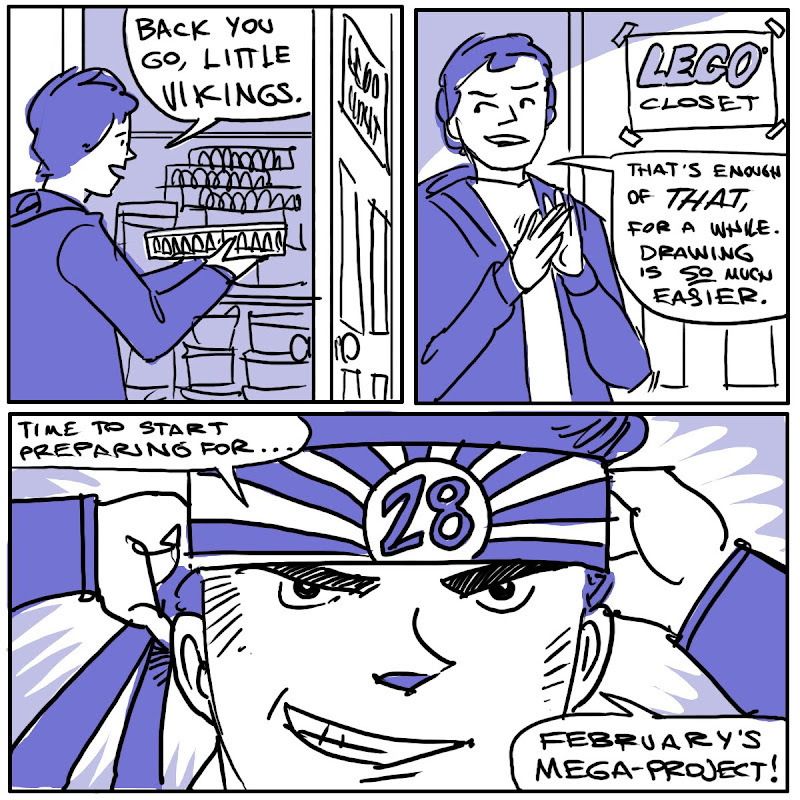 The mega project has to be the "28 Day Chicken Noodle Soup Diet." There's no way it could be anything else. It's not the "28 Day Chicken Noodle Soup Diet" but I am intrigued by this. VERY intrigued. Oh well, carry on with your mega project I suppose. Are you working on your graphic novel from NaNoWriMo? My NaNoWriMo project is still cooling down, and also, alas, still only 91% percent finished. Gotta finish that puppy. And don't worry Anonymous, we have all the time in the world to finish up the SPACE WEED. Although that little chapter of YB and P did sorta wrap up.